Retired Air Force Col. Joe M. Jackson, a Medal of Honor recipient and veteran of three wars has died. The 95-year-old Jackson passed away over the weekend, according to Air Force Secretary Heather Wilson and Air Force Chief of Staff Gen. Dave Goldfein, who made the announcement Monday morning. Jackson, a native of Newnan, Ga., was famous within the aviation and special operations community for his daring rescue of a team of Air Force combat controllers who were stranded at the besieged airfield of an abandoned Army Special Forces camp during the Tet Offensive. His exploits saved the lives of three men, but risked his own, as the airfield had been the site of multiple U.S. aircraft shoot downs and aircrew fatalities over the past 24 hours. 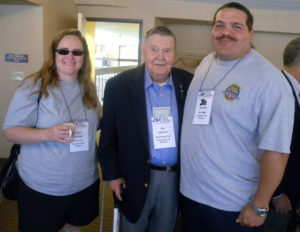 Jackson was an Associate member of the Blinded Veterans Association and spoke at the 2013 BVA National Convention.